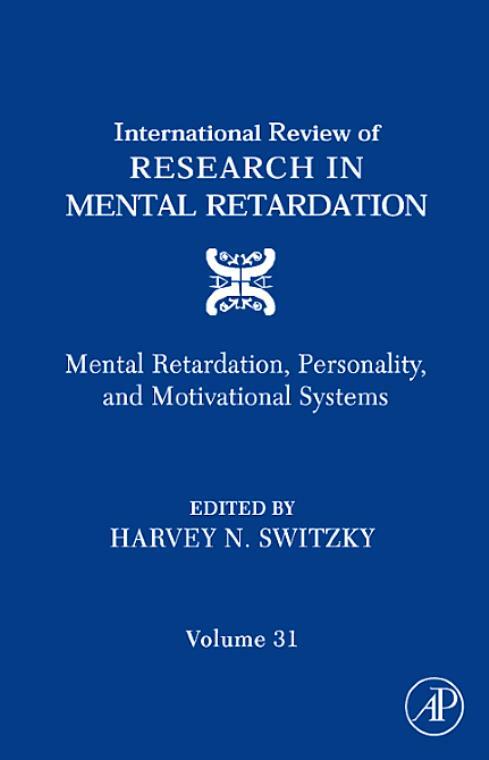 Volume 31 of the International Review of Research in Mental Retardation is a thematic exploration of personality and motivation in persons with mental retardation. Looking at a broad spectrum of intellectual disabilities, Mental Retardation, Personality, and Motivational Systems explores motivation as a moderator for performance and individualized effort. Coverage includes discussions of intrinsic and extrinsic motivation in both mentally retarded and non-retarded children, self-determination, interpersonal decision making in adolescents and adults with mental retardation, interpersonal relationships, and the connection between etiological-specific differences and motivation to form "behavioral phenotypes." A final chapter presents a transactional perspective on human ability, relying on constructs of intelligence, cognitive processes, and motivation, with implications for developmental interventions in the lives of persons with mental retardation. Twenty- First Century Models of Motivation and Personality in Persons with Intellectual Disability. Motivating persons with mental retardation. Self-Determination, Casual Agency, and Mental Retardation. The Role of Motivation in the Decision Making in Adolescents with Intellectual Disability. Individual Differences in Interpersonal Relationships for Persons with Mental Retardation. Diagnosis of Depression in People with Developmental Disabilities: Progress and Problems. Learning Disabilities and Depressive Episodes. Motivation and Etiology-Specific Cognitive -Linguistic Profiles. Behavior-Analytic Experimental Strategies and Motivational Processes in Persons with Mental Retardation.